Friends have been linking intellectual, social and spiritual growth for nearly 400 years. Teachers in Friends schools aim to expose children to a “way of seeing the world” that will have a lasting impact on their lives, nurturing a passion for the truth and concern for social justice; and confidence that they can make a difference. Our belief that our students are preparing for morally-based, global citizenship impels us to utilize the world around us, so they learn that there’s a larger community of which they are a part, that they can participate in it helpfully and that they can influence the lives of others in powerful, positive ways. STEAM Education is the integration of science, technology, engineering, art, math, and music across grades. The cross-curriculum, project-based approach to STEAM at MPFS prepares students for critical thinking, problem solving, collaboration, adaptability, and more in a quickly advancing world. A rotating schedule of structured after school enrichment courses for every age group is offered each trimester. 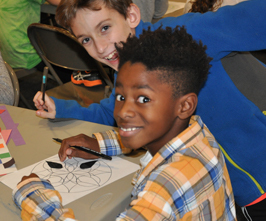 Classes may include Art Open Studio, Little Naturalists, Ceramics, Cooking, Math & Science Club, Drama, Photography, Zumba, Rock Jam Studio, Tae Kwon Do, Sewing, Yoga, and more. The Makerspace is a space solely dedicated to encouraging students of all ages to innovate, problem-solve, and create. Students will be equipped with high tech tools, such as a 3D printer; low tech tools, including handsaws and hammers; and tools in between, such as sewing machines.